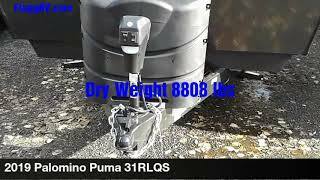 Hi, I am interested in your 2019 Palomino Puma (stock #78200) listed on Autotrader for $29,163. I'd like to get more information about this vehicle and confirm its availability. Imagine becoming a weekender or full-timer in this Puma 31RLQS travel trailer. If you are single or married and love the wilderness, it is time to start traveling with the comforts of home anywhere you choose. The kitchen offers everything you need, like the kitchen island, to make meals and snacks for yourself, for two, or for a group of friends and store your favorite camping goodies inside the walk-in pantry. You will find plenty of seating including two recliners, as well as the booth dinette and a sofa with end tables on either side. The bathroom even has a shower with seat, plus a linen closet to keep things neat and tidy. You can also choose to add a washer and dryer if you like. Dont keep thinking about it, this is your time!